Ghassamipour, S., Khadem Keshavarzi, R. (2017). Zirconium Dodecylphosphonate: Selective and Constructive Catalyst for Preparation of 2-Alkyl Benzoxazoles from Aliphatic Carboxylic Acids. Iranian Journal of Chemistry and Chemical Engineering (IJCCE), 36(1), 27-33. Soheila Ghassamipour; Rasool Khadem Keshavarzi. "Zirconium Dodecylphosphonate: Selective and Constructive Catalyst for Preparation of 2-Alkyl Benzoxazoles from Aliphatic Carboxylic Acids". Iranian Journal of Chemistry and Chemical Engineering (IJCCE), 36, 1, 2017, 27-33. Ghassamipour, S., Khadem Keshavarzi, R. (2017). 'Zirconium Dodecylphosphonate: Selective and Constructive Catalyst for Preparation of 2-Alkyl Benzoxazoles from Aliphatic Carboxylic Acids', Iranian Journal of Chemistry and Chemical Engineering (IJCCE), 36(1), pp. 27-33. Ghassamipour, S., Khadem Keshavarzi, R. Zirconium Dodecylphosphonate: Selective and Constructive Catalyst for Preparation of 2-Alkyl Benzoxazoles from Aliphatic Carboxylic Acids. 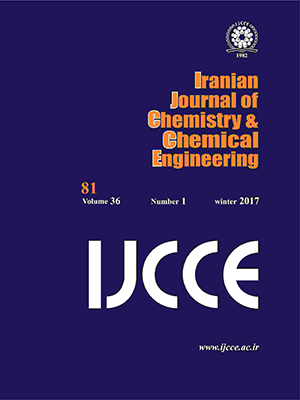 Iranian Journal of Chemistry and Chemical Engineering (IJCCE), 2017; 36(1): 27-33. In this study, zirconium dodecylphosphonate was synthesized by the reported method in scientific literature. 2-Alkylbenzoxazoles were prepared from aliphatic carboxylic acids and 2-aminophenol in the presence of this catalyst under solvent-free conditions at 100°C. Their structures were recognized by IR, 1H NMR, and 13C NMR. Then, we used aromatic carboxylic acids in the similar reaction. But, the results show aromatic carboxylic acids don’t react with 2-aminophenol. So, this method introduces a selective and constructive method for synthesis of 2-alkyl benzoxazoles without salt formation. On the other hand, this research offers several advantages such as high yields, good reaction times, easy work-up and use of a safe catalyst. Xu C., Synthesis and Structure-Activity Relationship of Novel Benzoxazole Derivatives as Melatonin Receptor Agonists, Bioorg. Med. Chem. Lett., 14: 3799-3802 (2004). Kumar D., Jacob M.R., Reynolds M.B., Kerwin S.M., Synthesis and Evaluation of Anticancer Benzoxazoles and Benzimidazoles Related to UK-1., Bioorg. Med. Chem., 10: 3997-4004 (2002). (a) Koci J., Klimesova V., Waisser K., Kaustova J., Dahse H. –M., Mollman U. Heterocyclic Benzazole Derivatives with Antimycobacterial in Vitro Activity, Bioorg. Med. Chem. Lett. 12: 3275-3278 (2002). (b) Temiz O., Oren I., Sener E., Yalcin I., Ucarturk N., Synthesis and Microbiological Activity of Some Novel 5- or 6-methyl-2-(2,4-disubstituted phenyl) Benzoxazole Derivatives, Farmaco., 53: 337-341 (1998). Edwards P., Dmeyer E.F., Vijayalakshmi J., Tuthill P.A., Andisik D.A., Design, Synthesis, and Kinetic Evaluation of a Unique Class of Elastase Inhibitors, the Peptidyl Alpha-Ketobenzoxazoles, and the X-Ray Crystal Structure of the Covalent Complex between Porcine Pancreatic Elastase and Ac-Ala-Pro-Val-2-benzoxazole, J. Am. Chem. Soc., 114: 1854-1863 (1992). 2-Benzylbenzoxazoles and 2-benzylbenzo­thiazoles as Potential Photochromic Compounds, Synthesis, 1112- 1116 (2003). Reser A., Trost B. M., Fleemming L. J., Saunderxs D., Mijovic M. V., Bruight A., Bogie J, Fluorescence of Aromatic Benzoxazole Derivatives, J. Am. Chem. Soc., 94: 2414-2421 (1972). (a) Seijas J. A., Vazquez T., Pilar M., Carballido R., Raquel M., Crecente C. J., Romar-Lopez L., Lawesson’s Reagent and Microwaves: A New Efficient Access to Benzoxazoles and Benzothiazoles from Carboxylic Acids under Solvent-Free Conditions, Synlett. 313-317 (2007). (b) Maradolla M.B., Allam S.K., Mandha A., Chandramouli G.V.P., One Pot Synthesis of Benzoxazoles, Benzthiazoles and Benzimidazoles from Carboxylic Acids Using Ionic Lliquid, ARKIVOC. XV:42-46 (2008). (c) Niknam, K., Fatehi-Raviz, A. Synthesis of 2-Substituted Benzimidazoles and Bis-benzimidazoles by Microwave in the Presence of Alumina-Methanesulfonic Acid, J. Iran. Chem. Soc. 4 (4): 438-443 (2007). 2-Substituted Benzimidazols and 3,1,5-Benzoxadiazepines, Tetrahedron Lett., 45: 4185-4187 (2004). Shi D.F., Bradshaw T.D., Wrigley S., McCall C.J., Lelieveld P., Fichtner I., Stevens M.F., Antitumor Benzothiazoles. 3. Synthesis of 2-(4-aminophenyl) Benzothiazoles and Evaluation of Their Activities Against Breast Cancer Cell Lines in Vitro and in Vivo, J. Med. Chem. 39: 3375-3384 (1996). Riadi Y., Mamouni R., Azzalou R., El Haddad M., Routier S., Guillaumet G., Lazar S., An Efficient and Reusable Heterogeneous Catalyst Animal Bone Meal for Facile Synthesis of Benzimidazoles, Benzoxazoles and Benzothiazoles, Tetrahedron Lett. 52 : 3492-3495 (2011). (b) Bachhav H.M., Bhagat S.B., Telvekar V.N., Efficient Protocol for the Synthesis of Quinoxaline, Benzoxazole and Benzimidazole Derivatives Using Glycerol as Green Solvent, Tetrahedron Lett., 52: 5697-5701 (2011). (c) Blacker A.J., Farah M.M., Hall M.I., Marsden S.P., Saidi O., Williams J.M., Synthesis of Benzazoles by Hydrogen-Transfer Catalysis, Org. Lett., 11: 2039-2042 (2009). (d) Kumar, A., Maurya, R.A., Saxena, D. Diversity-Oriented Synthesis of Benzimidazole, Benzoxazole, Benzothiazole and Quinazolin-4(3H)-One Libraries Via Potassium Persulfate–CuSO4-Mediated Oxidative Coupling Reactions of Aldehydes in Aqueous Micelles, Mol. Divers., 14 (2) : 331-341(2010). (e) Mohammadpoor-Baltork, I., Moghadam, M., Tangestaninejad, S., Mirkhani, V., Zolfigol, M.A., Hojati S.F., Silica Sulfuric Acid Catalyzed Synthesis of Benzoxazoles, Benzimidazoles and Oxazolo[4,5-b]pyridines under Heterogeneous and Solvent-Free Conditions, J. Iran. Chem. Soc., 5 (1): 565-570 (2008). (f) Sharghi, H., Aberi, M., Doroodmani, M. M. One-Pot Synthesis of 2-Arylbenzimidazole, 2-Arylbenzothiazole and 2-Arylbenzoxazole Derivatives using Vanadium(IV)-Salen Complex as Homogeneous Catalyst and Vanadium(IV)-Salen Complex Nanoparticles Immobilized onto Silica as a Heterogeneous Nanocatalyst, J. Iran. Chem. Soc., 9(2): 189-204 (2012). (g) Khalafi-Nezhad A., Panahi F., Yousefi R., Sarrafi S., alipour G., Magnetic Nanoparticles-supported Tungstosilicic Acid: as an Efficient Magnetically Separable Solid Acid for the Synthesis of Benzoazoles in Water, J. Iran. Chem. Soc., 11(5): 1311-1319 (2014). Shen G., Bao W., Synthesis of Benzoxazole and Benzimidazole Derivatives via Ligand-Free Copper(I)-Catalyzed Cross-Coupling Reaction of o-halophenols or o-haloanilines with Carbodiimides. Adv. Synth. Catal. 352 (6): 981-986 (2010). Yu, J., Shen, M., Lu, M. Aerobic Oxidative Synthesis of 2-Arylbenzimidazoles, 2-Arylbenzoxazoles, and 2-Arylbenzothiazoles from Arylmethanols or Arylmethylamines Catalyzed by Fe(III)/TEMPO under Solvent-Free Conditions, J. Iran. Chem. Soc., 12(5): 771-778 (2015). Terashima M., Ishii M. A Facile Synthesis of 2-Substituted Benzoxazoles, Synthesis, 484-485 (1982). (a) Hein D. W., Albeim R. J., Leavitt J. J. The Use of Polyphosphoric Acid in the Synthesis of 2-Aryl- and 2-Alkyl-Substituted Benzimidazoles, Benzoxazoles and Benzothiazoles, J. Am. Chem. Soc. 79 : 427-429 (1957). (b) Singh G., Kaur M., Mohan C., Prashar S., Synthesis and Antimicrobial Activity of Benzoxazole Derivatives, IAJPR, 3(8): 6113-6118 (2013). Wen X., El Bakali J., Deprez-Poulain R., Deprez B., Efficient Propylphosphonic Anhydride (T3P) Mediated Synthesis of Benzothiazoles, Benzoxazoles and Benzimidazoles, Tetrahedron Lett. 53: 2440- 2443 (2012). Wang Y.,Sarris K., Sauer D.R., Djuric S.W., A Simple and Efficient One Step Synthesis of Benzoxazoles and Benzimidazoles from Carboxylic Acids, Tetrahedron Lett., 47: 4823-4826 (2006). (a) Ghassamipour S., Sardarian A.R., Friedländer Synthesis of Poly-Substituted Quinolines in the Presence of Dodecylphosphonic Acid (DPA) as a Highly Efficient, Recyclable and Novel Catalyst in Aqueous Media and Solvent-Free Conditions. Tetrahedron Lett. 50: 514-519 (2009). (b) Ghassamipour S., Sardarian A.R., One-Pot Synthesis of Dihydropyrimidinones by Dodecylphosphonic Acid as Solid Bronsted Acid Catalyst under Solvent-Free Conditions via Biginelli Condensation, J. Iran. Chem. Soc., 7: 237-242 (2010). (c) Ghassamipour S., Sardarian A.R., Facile Catalyzed Preparation of 14-aryl- or Alkyl-14-H-Dibenzo[a,j]Xanthenes by Dodecylphosphonic Acid and Dodecylsulfamic Acid: Environmentally Benign Methods. J. Heterocycl. Chem., 49: 669-674 (2012). (d) Ghassamipour S., Ghashghaei R., A Green Procedure for Synthesis of Xanthene Derivatives: Micellar Solution of Sodium Dodecylphosphonate Catalyzes Condensation Reaction of Aldehydes and β-naphthol in Aqueous Media, I. J. Catal 4(1): 49-53 (2014). (e) Ghassamipour S., Ghashghaei R., Zirconium Dodecylphosphonate Promoted Synthesis of Xanthene Derivatives by Condensation Reaction of Aldehydes and β-naphthol or Dimedone in Green Media, Monatsh Chem. 146(1): 159-163 (2015). Segawa K., Kihara N., Yamamoto J. Catalyst Design of Two-Dimensional Zirconium Phosphonates, Mol. Catal., 74: 213- 221(1992). (a) Zolfigol M.A., Salehi P., Ghaderi A., Shiri M., Tanbakouchian Z., An Eco-Friendly Procedure for the Synthesis of Polysubstituted Quinolines under Aqueous Media, J. Mol. Cat. A: Chem. 259 (1-2): 253-258 (2006). (b) Firouzabadi H., Iranpoor N., Khoshnood A., Aluminum Tris (dodecyl sulfate) Trihydrate Al(DS)3·3H2O as an Efficient Lewis Acid–Surfactant-Combined Catalyst for Organic Reactions in Water: Efficient Conversion of Epoxides to Thiiranes and to Amino Alcohols at Room Temperature, J. Mol. Cat. A: Chem. 274 (1–2): 109-115 (2007). (c) Firouzabadi H., Iranpoor N., Jafari A.A., Riazymontazer E., Metal-Free Chemoselective Oxidation of Sulfides to Sulfoxides by Hydrogen Peroxide Catalyzed by in Situ Generated Dodecyl Hydrogen Sulfate in the Absence of Organic co-solvents. Adv. Synth. Catal. 348 (4-5): 434–438 (2006). (d) Firouzabadi H., Iranpoor N., Nowrouz F., The Facile and Efficient Michael Addition of Indoles and Pyrrole to α,β-unsaturated Electron-Deficient Compounds Catalyzed by Aluminium Dodecyl Sulfate Trihydrate [Al(DS)3]·3H2O in Water, Chem. Commun., 789-791(2005). Chikhale R.V., Pant A.M., Menghani S.S., Wadibhasme P.G., Khedekar P.B., Facile and Efficient Synthesis of Benzoxazole Derivatives Using Novel Catalytic Activity of PEG-SO3H, Arab. J. Chem. In Press, (2014). Jenkins G.L., Knevel A.M., Davis C.S., A New Synthesis of the Benzothiazole and Benzoxazole Rings, J. Org. Chem., 26 (1): 274-274 (1961).